It's been a couple of weeks since we have sent out a newsletter, but we're back with a great offer. What's so good about this all-in-one printer? Well, for a start, it's cheap to run. It uses Kodak's Verite 5 ink cartridges which can cost up to 50% less than other cartridges based on print output. Also, the ECO print mode uses 30% less ink, saving you even more money. 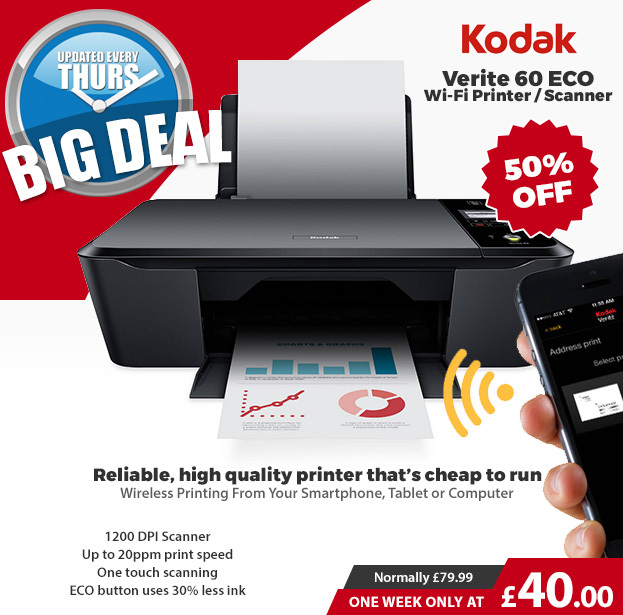 It's not all about saving money though, the Kodak Verite 60 is a good quality printer and since it is wireless, you can print directly from your smartphone, tablet, laptop or computer. The built in scanner has an impressive 1200dpi resolution for detailed results. It's super easy to set up so once you get it, you'll be up and running in no time. Remember that the special price only lasts for 7 days, so order now to avoid disappointment. All logos & trademarks used are acknowledged to their respective owners. This e-mail has been sent to you by Bigpockets.co.uk because you have signed-up for it at some point in the past. At Bigpockets, we take privacy and spam very seriously and we will only send email to customers who have requested it. If you do not wish to receive such e-mails you can easily unsubscribe at any time by clicking on the link at the bottom of this message. Payment: We accept most form of payment, including all majors form of credit and debit card as well as Paypal. We do not offer Purchase Order facilities for Schools and other academic institutions at the moment. Despatch time: 98% of orders which we receive before 3pm are despatched the same day. However, some orders may experience slight delays due to security and other reasons. If you need your order urgently, we advise you or place your order as early in the day as possible. Delivery: Two standard delivery options are available for UK mainland- Royal Mail and courier. If your order is small/light enough you will be offered the choice of Royal Mail or courier at the checkout. For larger orders, only the courier option will be available. All Royal Mail orders are sent via Royal Mail 48. Courier delivery is either economy or 24 hours service (from time of dispatch) and fully trackable. You can select your preferred delivery method at the checkout. Delivery Restrictions: Some products, notably TVs, can only be sent to UK Mainland addresses. Fr.ee Delivery: We do offer a range of `Fr.ee Delivery` products. When you purchase one of these, delivery for your entire order will be fr.ee of charge, regardless of the number of items you order. Products which have this fr.ee delivery feature are marked as such both in the category listing pages as well as the product description itself. In addition, you can see all of our current fr.ee delivery products by clicking on the `fr.ee delivery` banner on the right hand side of the website. Condition of Goods : Most of our products are brand new and come with a full 12 months manufacturers warranty. We also sell `as new`, `refurbished` and `used` items (particularly laptops). The condition of all goods is clearly stated in the description and product overview as well as the warranty period. Contact: You can get in touch with us either by telephone or email. We have a contact form available on our website where you will also find our telephone number.